Important: PaperCut MF 18.2.0 or above allows users to change the settings of held print jobs at the device. If you implement Advanced scripting (print scripting) that applies to these settings, then ensure to stop users from being able to change such settings at the device. For more information, see Changing print job settings at the MFD. PaperCut NG/MF's advanced scripting interface is a powerful and flexible feature that you can use to define and fine tune your printing policy. While there are many features that you can enable by selecting check boxes and changing options in the Admin web interface, scripting your own behavior introduces a whole new level of customization. Displaying a popup message if a user forgets to select duplex on large jobs. 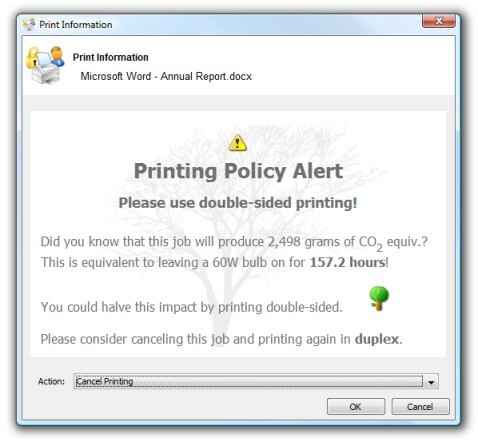 Showing a dialog that displays environmental impact statistics about a user's print job such as the amount of carbon dioxide equivalent greenhouse gases produced. Automatically routing large jobs to more efficient high volume printers. All of the above is possible by writing a small script directly into a code editor in the Admin web interface. In fact, the above functionality is a pre-built recipe ready to use. Charging printing to departments during class-time. Displaying warning messages under selected conditions. Adapt logic based on print job attributes such as cost, pages, document name, time, etc. Modify job attributes and behavior such as routing the job to another printer, influencing job cost and account charged, and appending metadata such as comments. Interact with end users via client messages and popups/dialog boxes. Quick access to a code cookbook containing dozens of best-practice recipes. Pre-canned "code snippets" demonstrating the use of key functions. Simple debugging tools such as logging and runtime error reporting. Caution: PaperCut MF 18.2.0 or above allows users to change the settings of held print jobs at the device. If you implement Advanced scripting (print scripting) that applies to these settings, then ensure to stop users from being able to change such settings at the device. For more information, see Changing print job settings at the MFD. All scripts are defined on a per printer basis allowing each printer to have its own logic (although you can share/copy a common script between printers, see Copy printer settings). Select the Enable print script checkbox. One good way to experiment with print scripting is to apply your script initially on a test printer (or fake print queueA print queue displays information about documents that are waiting to be printed, such as the printing status, document owner, and number of pages to print. You can use the print queue to view, pause, resume, restart, and cancel print jobs., such as a print queue pointing to an unused LPT port). This allows you to test and experiment, and when the logic is right, copy/deploy across to other live printers. Recipes demonstrate best practice and should be considered as a starting point for development of your own scripts. Click Import next to the recipe you want to use. The recipe replaces what is currently in your script. Code snippets are small code fragments that demonstrate how to use the scripting APIApplication Programming Interface (API) is a set of routines, protocols, and tools for building software and applications. An API expresses a software component in terms of its operations, inputs, outputs, and underlying types, defining functionalities that are independent of their respective implementations, which allows definitions and implementations to vary without compromising the interface. (inputs, functions, and methods). Consider using snippets as a base for adding functionality to your script. Place your cursor in the position you want to insert the snippet. Click Insert Snippet at Cursor. 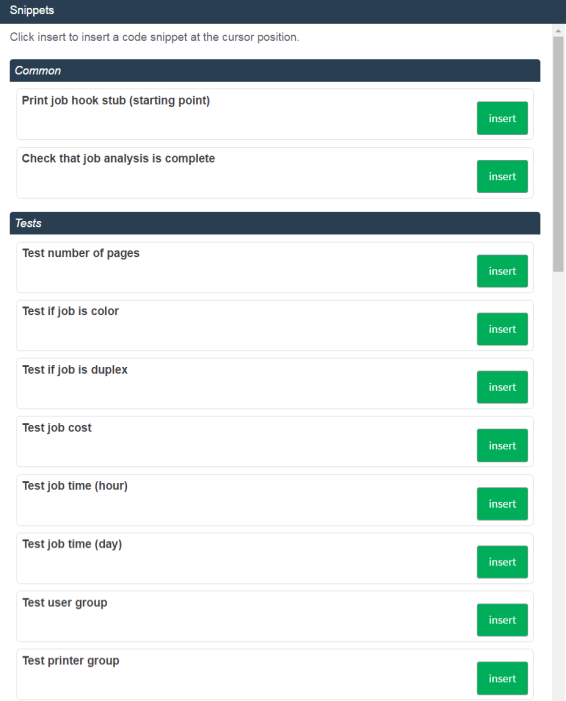 A list of code snippets is displayed. For example, the Test if job is color snippet provides the code to check if a print job is being printed in color. This could be used as part of a script to perform an action on all color print jobs. Click insert next to the snippet you want to use. The snippet is added to your script. If required, you can modify the code to suit your needs. 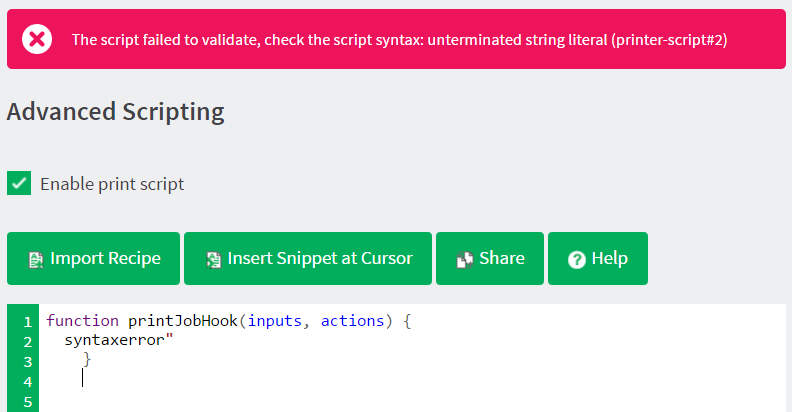 Syntax errors—these are detected and displayed when a script is applied. The script does not save until all syntax errors are addressed. Runtime errors—these are errors that only occur when a script is executed for a print job. Runtime errors are also listed on the Scripting tab in red. Refresh the page to see runtime errors. Runtime errors are also logged and are displayed on the App Log tab. Where possible the error message indicates the line number on which the error was found and the relevant line is highlighted. Large organizations with advanced print scripting requirements might need to share common code between different print scripts. Use advanced scripting techniques to build these common libraries. Errors in the common print script are detected and displayed in the Scripting page. The error message contains the name of the common script file, the error, and the line number where the error occurred. Refresh the page to see these errors. These errors are also displayed on the App. Log page. Use snippets and/or recipes where possible. They are tested and demonstrate best practice. Start out small and aim high. Don't try building your script all in one go. Write a bit, test, then move on. Large scripts written in one go are hard to debug. Always test your scripts! Just because a script compiles does not mean it is bug free. Take time to test your script and exercise all logic paths. For example, if your script applies an action to jobs with more than 100 pages, test it by printing jobs that are both more and less than 100 pages. Check all your scripts from time to time for runtime errors and/or enable error level event notifications to receive an email when errors occur (see Error level event notifications). Take some time to explore the list of methods in the reference API documentation (see Print script API reference). Knowing what is possible can open up ideas. Use actions.log.debug() or actions.client.sendMessage() to assist with "print line" style debugging. If your scripts interact with end users, perform some usability testing to ensure they understand your messages and intentions. Consider using HTML markup to pretty up your dialog messages (see the snippet titled Show a dialog with HTML formatting). PaperCut MF 18.2.0 or above allows users to change the settings of held print jobs at the device. If you implement Advanced scripting (print scripting) that applies to these settings, then ensure to stop users from being able to change such settings at the device. For more information, see Changing print job settings at the MFD.